SO as long as they just hang out in the basement or garage or whatever I’m completely fine with spiders. Hey, they make great listeners! And (as far as I know), with the exception of two easily identifiable species – the brown recluse, and the black widow – North American arachnids are pretty much harmless to humans, but an absolute scourge to other nuisance insects like flies and mosquitoes and whatnot. It can get kinda gross when they start laying eggs all over the place though. Still, awesome little critters – in moderation. Knowing something about them is essential to their appreciation though – the rap they get in popular culture, as well as people’s perhaps innate fear of them, makes the majority of folks probably more likely to swat one than make a pet out of it, (though as a compromise you could always just catch it and toss it in the garden), which is where Christopher M. Buddle and Eleanor Spicer Rice’s new book, Dr. Eleanor’s Book of Common Spiders, comes in. 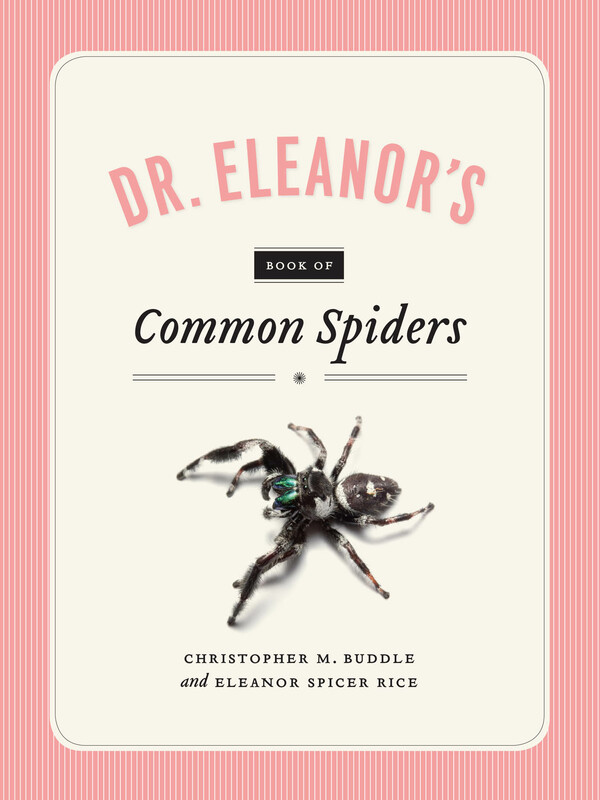 Here Eleanor Spicer-Rice, renown science writer and entomologist by training (entomologists btw study insects, not arachnids), teams up with arachnologist Christopher Buddle to uncover the hidden lives of spiders, and perhaps engender a little more appreciation for our arachnid neighbors, or roommates, as the case may be. Alongside some awesome close-up images, the book showcases some of their lesser known behaviors, like that of the semi-aquatic Fishing Spider, which has actually been known to capture small fish for its prey, or the Zebra Jumper Spider, which does not build a web but rather uses its remarkable agility to pounce on its prey. Offering more details on her new book, and the therapeutic affect getting to know these fascinating creatures has had on her own arachnophobia, Eleanor Spicer Rice held an insightful discussion all about spiders today on North Carolina Public Radio’s The State of Things with host Frank Stasio. Archived audio from the program as well as a gallery of images from the book is available at the WUNC site. And if you’re in the Raleigh area this Thursday, Christopher M. Buddle will join Dr. Spicer Rice at the North Carolina Museum of Natural Sciences to speak as part of the Museum’s Science Cafe lecture series. So, as the title of their talk suggests, pick up a copy of Dr. Eleanor’s Book of Common Spiders and get to know your friends, the spiders – guaranteed less venomous, and more useful, than most of your human friends. Just ask Wilbur!